Select stakeholders were invited to the consultation meeting held on April 6, 2018. Anubha Sinha attended it along with a few other public-spirited stakeholders. She made a statement stressing on the requirement of the patent system to serve the welfare-purpose and not create mere non-working/ blocking monopolies; and that the argument of representatives of patentees about non-working of patents being the existing norm, and that they cannot be questioned about this, is absolutely against the central tenets of patent law. All written submissions can be accessed here. As the CGPDTM is aware, the Indian mobile device manufacturing industry is mired in issues related to licensing of standard essential patents (SEPs). Disputes have resulted in imposition of heavy interim royalty rates on Indian manufacturers, payable to foreign SEP holders. Section 146 and Rule 131 of the Patents Act, 1970 mandate patentees to provide information on working of patents, which is crucial for willing licensees to access patent working information in a timely manner. This requirement, that the details of patent working be disclosed by patentees supports several policy goals, firstly, of making the Indian population benefit from commercial use of the invention; secondly, prevents patentees from creating blocking monopolies – from obtaining and maintaining patents for the purpose of blocking others from developing technologies in the vicinity of the patented inventions; and thirdly, by showing that reasonable requirements of the public are met (or not), directly impacts the implementation of the compulsory licensing scheme of the Patents Act, 1970. We note that in 2009, 2013 and 2015 the CGPDTM issued public notices calling on patent owners to comply with their obligations to file statements of working on Form 27. Further, on February 12, 2013, the Indian Patent Office (IPO) announced plans to make Form 27 submissions for the year 2012 available to the public via the IPO website. However, these measures have not yielded any significant progress, as patentees and licensees continue to not comply or defectively comply with the statutory requirements. CIS’ empirical research on ICT innovations reveals that there are serious lapses as far as compliance and enforcement of statutory provisions mandating filing of Form 27 are concerned. 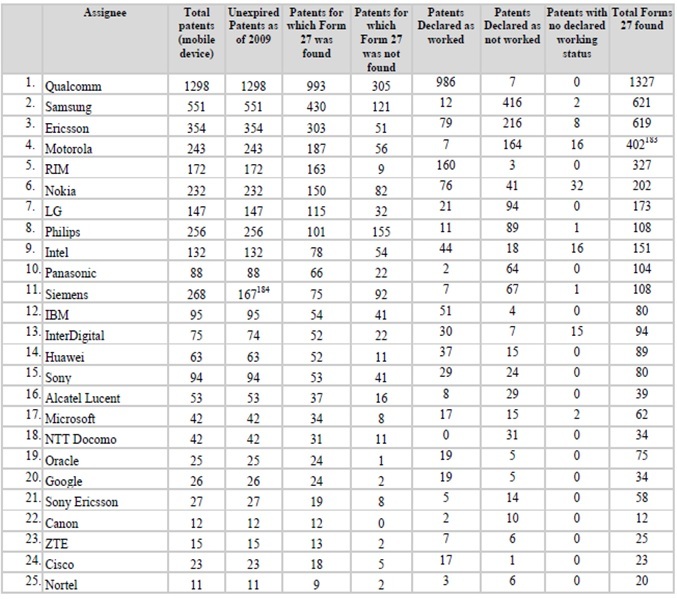 In the past year, we studied data available from 2009- 2016 for the mobile device sector, and could only identify and access 4,916 valid Forms 27, corresponding to 3,126 mobile device patents, leaving 1,186 Indian patents for which a Form 27 could have been filed, but was not found. 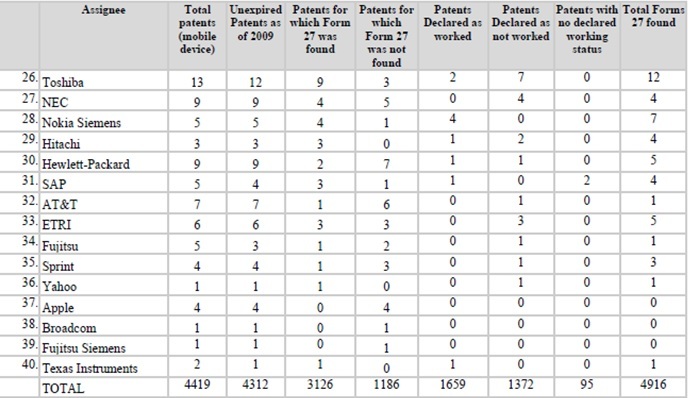 For a surprising number of Form 27s (3%) the working status of the relevant patent was not even designated. Even among the Form 27s that had been obtained, almost none contained useful information regarding the working of the subject patents or fully complying with the informational requirements of the Indian Patent Rules. Many patentees simply omitted required descriptive information from their forms without any explanation. Via our research we also gathered complaints raised by patentees and industry observers regarding the structure of the Form 27 requirement itself. For example, patents covering complex, multi-component products that embody dozens of technical standards and thousands of patents may not necessarily be amenable to the individual-level data requested by Form 27. Thus, our findings support the arguments and findings made by the petitioners in the ongoing matter of Shamnad Basheer v. Union of India and Ors. Two industry associations, namely Telecom Equipment Manufacturers Association of India (TEMA) and Telecom Equipment & Services Export Promotion Council (TEPC) and a telecommunication enabler Vihan Network Limited recommended that a modified and longer version of Form 27 (Form 27S) may be designed for SEP holders that should apply right at the filing stage. Section 159 of the Patent Act, 1970 empowers the central government to make such modifications to the form, as necessary. Further, Prof. T Ramakrishna (MHRD Chair on Intellectual Property Rights) at NLSIU, specifically recommended that Form 27 may be amended to include a new column, which may require the patent holder to declare if their patent forms a part of any standard and in case of affirmative answer – the name of the Standard Setting Organisation and corresponding standard of which it is a part. We recommend that the form may be amended to make it more comprehensive and suitable for obtaining necessary information. The same information should be made publicly accessible, in order to satisfy the Indian citizen that the patent is being properly worked. Some PDFs of the forms comprise scanned image files without OCR of the text. This makes them inaccessible to the visually impaired, and prevents search and discoverability of their content. This also makes them less usable by preventing copying and selection of text. In some cases, it was difficult to identify which one in the list of documents associated with a patent is Form 27, because of obscure filenames. For example, for Patent Number 262228, Form 27 was named 68.262228.pdf, as found on IPAIRS. For Patent number 260603, the filename for Form 27 was "ipindiaonline.gov.in_epatentfiling_online_frmPreview.asp.pdf" on IPAIRS. Inconsistency in search results found on IPAIRS. Searching for the peripheral documents of the patents, returned the results, "No PDF found" for one full week. The next week, the documents started showing. Some searches returned results for an entirely different patent number. Sometimes, Form 27 found on InPASS was not found on IPAIRS and vice versa. Runtime errors occur due to browser caching. IPAIRS returned either a 404 error or Connection Time Out ("site is taking too long to respond") http://ipindiaonline.gov.in/patentsearch/search/index.aspx. In our opinion, it could be redirected to InPASS as it uses the same search engine as InPASS. Further, http://ipindia.nic.in/patsea.htm returned a 404 error. We are thankful to the Indian Patent Office for the opportunity to make these submissions. It would be our pleasure and privilege to discuss these submissions and recommendations in details at the Stakeholders’ Meeting on 21 March, 2018. Refer to Appendix for a breakdown of compliance of Form 27 by patent holders in the mobile device sector. See Shamnad Basheer, Making Patents Work: Of IP Duties and Deficient Disclosures, 7 QUEEN MARY J. INTELL. PROP. 3, 6-17 (2017). Section 159 of the Patent Act, 1970 empowers the central government to make rules. Accordingly, the Rule 131 of the Patents Rules, 2003 prescribes Form 27 as the manner in which section 146(2) of the Act is to be implemented. An email by Rohini Lakshane (CIS) compiling these issues was sent to Dr. K.S. Kardam (Senior Joint Controller of Patents and Designs - ‎Indian Patent Office) on 09.09.2017. Click to download the submission by CIS made on March 16, 2018 here.